So, I am totally late on this one… which is inexcusable really, because I was at the Opening of the exhibition. Least I could have done is pub it. But, alas…. 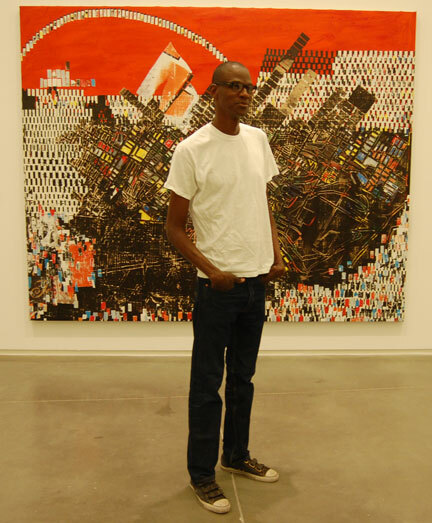 Mark Bradford‘s Exhibition currently on view at Chicago’s Museum of Contemporary Art is a Retrospective that really gives a sense of the artist’s use of layers to establish history and depth in his work. A number of the pieces displayed (like “Strawberry”, [pictured below]) feature small square wrapping papers (the sort used in beauty parlors to augment rollers) as a medium. One particular work utilizes sun faded wheatpaste movie posters. A good measure of his materials are, in fact, well known residents of his neighborhood, and his work whispers of larger community-based issues. Some of his work even echos Topographical maps. 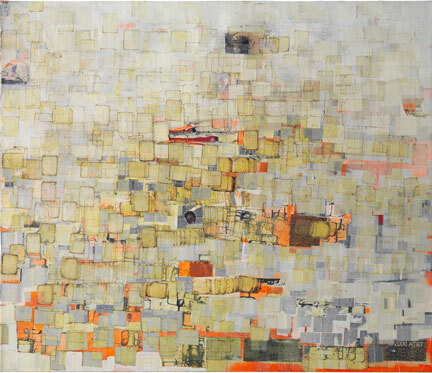 In part due to his works’ scale, and in part due to his use of texture, his work needs to be seen in person, rather than in print or on a screen. On the Collaborative tip, during this past year, the Artist was Skyping and Zipping back and forth between his homebase of Los Angeles and our fair city working with youth from both Lindblom Math and Science Academy in West Englewood and the YOUMedia Program at the Harold Washington Library culminating in a well received Pop-Up Gallery exhibition of the Students’ work. The exhibition (a part of the MCA-backed Mark Bradford Project) dealt with issues of community and mapping, while using a variety of mediums. Many of the students agreed that they learned as much about life as they did about artistic practice from Bradford, who beautifully validated the burgeoning voices of the self-proclaimed “Art Kids”. 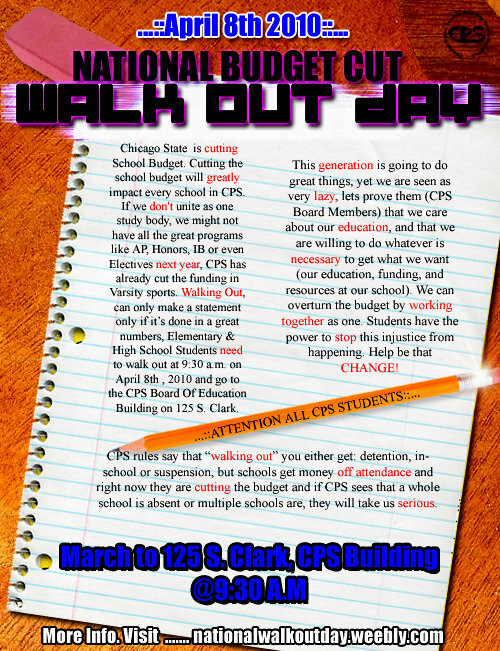 My Teen Talk Radio students tell me that many students at our school (Uplift Community High) are planning on walking out of school on Thursday April 8th at 9:30am to protest proposed CPS (Chicago Public Schools) budget cuts. Another school involved is Social Justice High School at Little Village/Lawndale High School’s campus (a school I’ve also worked with). Taking into account the deficit, budget cuts certainly must be made; but students wonder how enrichment that supports at-risk students and gives students a chance at post-secondary success (via sports and other after school programs) can be considered for the chopping block. They are (in their mind) just as, or even more essential than what goes on between the bells. The budget will not officially be approved by the board until August. This, of course, opened the door for a classroom discussion about whether such protests still work, and what the pros and cons of such displays are. Many of my students will cover the walkout and subsequent rally as student journalists. Below is some of our board work. 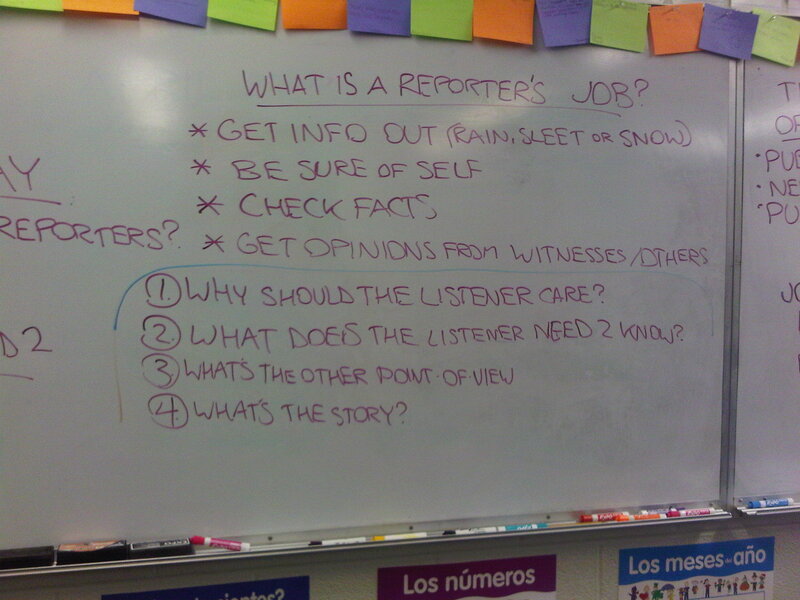 Great to know that students aren’t as apathetic as the media leads us to believe. Jive on! Thursday, February 18, 2010 @ 6:00 p.m. Inspired by a modernist fascination with the “primitive,” the first half of the 20th century saw a developing aesthetic appreciation for objects from sub-Saharan Africa and elsewhere, which formerly were dismissed as mere curiosities or classified as ethnographica. In this lecture, Christa Clarke of Newark Museum considers the influence of modernism in shaping Western perceptions of African art, as reflected in exhibition display as well as the formation of institutional and private collections in the United States. art pictured: Fang; Gabon. 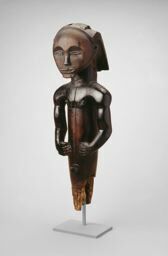 Reliquary Figure (Nlo Bieri), Late 19th/early 20th century. Gift of Mr. and Mrs. Raymond Wielgus. Our October A La Carte features J. Nicole Brooks, playwright of “Fedra” at Lookingglass Theater and African-American Illusionist Walter King Jr. We’re talking about SPECTACLE. What is it? How does it work? Is it low-brow theater? Is it a cop-out to creating dramatic narratives? We’ve asked Walter King Jr. to share his experience as an illusionist and how his “magic ” of theater creates a form of SPECTACLE. J. Nicole Brooks, company member and playwright of the highly anticipated “Fedra” at Lookingglass Theater will share in her experience with the company and their approach to creating SPECTACLE. Portoluz, the music and culture organization borne out the ashes of Hothouse, presents a community wide celebration and art-making event honoring those who’ve left us. Help create a community ofrenda (see below), and make a calavera (or skull) to take home with you. Music will be supplied by Jarochicanos, son jaracho youth group. 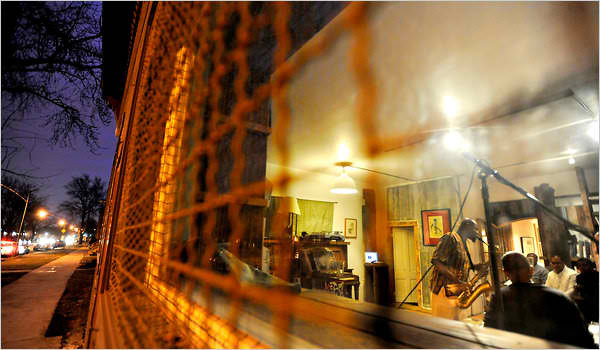 art, above: from “Public Address”, an art installment/retail concept curated by Ellen Rothberg. Chicago, 2008. Thursday, October 1st at Bronzeville’s Little Black Pearl Art & Design Center, there will be a panel discussion focusing on the Arts scenes in these three cities (and the intersection of art and community activism). Panelists and other participants will be in attendance at Little Black Pearl, Contemporary Art Institute of Detroit, and The Luminary Center for the Arts in Saint Louis and will be connected via skype. Chicago Panelists include Lindsay Obermeyer, Jennifer Karmin, and friends of Darkjive: Dan Godston, Theaster Gates, and Carol Ng-He. This installment explores comedy through the lens of Stand-up comics & Improv/Sketch groups. Join Tofu Chitlin Circuit at their monthly forum discussion on performance arts issues and controversies. The Bronzeville-based Theatre Conservatory has put together a panel featuring Chicago Improv Festival producer Jonathan Pitts, comedian Meechie Hall, female Asian comic Leah Eva, ‘King of Bronzeville’ Brian Babylon, Cameron Esposito, & Mpaact Theater Company. Ronnie Kitchen and Martin Reeves – both released from prison on July 7th after being incarcerated for twenty-one years for crimes they did not commit – will share their personal stories with the community at Imagine Englewood If (1854 W Garfield Blvd). This is a special Café Society event co-sponsored by the Neighborhood Writing Alliance, The Public Square, and Imagine Englewood If. Imagine Englewood “if” is a youth center whose mission is to strengthen and empower the greater Englewood community through teaching local youth healthy living, environmental awareness and positive communication skills. Click here for their story, as reported by Chicago Public Radio, WBEZ.